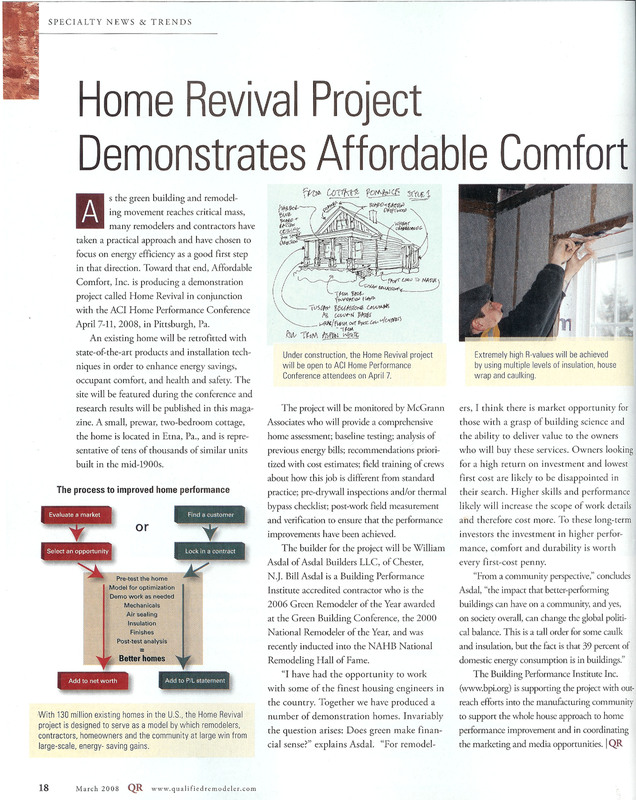 I have had the opportunity to work with some of the finest housing engineers in the country. Together we have produced a number of demonstration homes. Invariably the question arises, “does ‘green’ make financial sense?” There are three levels of response. Each is different. Does “green” make financial sense to the owners, to the builders, or to communities? A builder can certainly ramp up his skills to provide a package of products, enhanced skills, and performance verification to produce a more effective building, whether delivered in an existing shell or from the ground up. Supplying this niche skill set to a market certainly can enhance business opportunities. Amending your business plan to accommodate a wide range of green solutions is a worthy business goal. The public has interest, and the skills are not widely mastered. I think there is market opportunity for those with a better grasp of building science, and the ability to deliver value to the owners who will buy these services. Owners looking for a high return on investment and lowest first cost are likely to be disappointed in their search. Higher skills and performance likely will increase the scope of work details and therefore cost more. The savvy buyer will look to the decision tool on the lower left and weigh operating cost reduction, durability, and a lower carbon footprint as a high value target. To these long term investors the investment in higher performance, comfort, and durability is worth every first-cost penny. The impact that better-performing buildings can have on a community, and yes, on society overall, can change the global political balance. This is a tall order for what may be some caulk and insulation, but the fact is that 39% of domestic energy consumption is in buildings. This consumption is even more than all our transportation energy consumption combined. Abraham Lincoln said in 1863, “The strength of a nation can be seen in its housing.” No doubt that as we strengthen our homes for the next generation, the lowered dependence on fossil fuels can only help in keeping America on the front edge of global leadership. Continued dependency on fossil fuels is both unproductive to our economy and nation, but fills the coffers of many who would relish our continued dependence on these fuels. This demonstration home is neither zero-energy nor free of the grid. What it is, however, is smart housing solutions well-delivered to a market need for clean, affordable residences. Delivering on this premise, we all win.